Over the last 100 years the concentration of ground-level ozone (O3) has doubled due to increasing industrialization and traffic. For the formation of ground-level ozone anthropogenically emitted nitrogen oxides (NOx = NO + NO2), organic trace gases emitted primarily from plants and sunlight are necessary. Both, humans and plants are exposed to enhanced ozone concentrations nowadays. How harmful ozone is to humans and plants depends primarily on the absorbed amount of ozone. If the ozone flux into the plant exceeds a certain amount discolorations and necrosis of isolated spots on the plant leaves are formed and can further lead to vegetation loss. Due to ozone damage on agricultural crops billions of dollars are lost annually worldwide. It is well known that various plant species but also different genotypes of a species (e.g. various types of tobacco plants) react specifically to ozone exposure. For example, sensitive tobacco types are used as bio-indicators to estimate the amount of ozone uptake. Plants usually have antioxidant systems in their cells to detoxify the permanently formed reactive oxygen species, like ozone (O3) or peroxides (ROOH). If these defense systems cannot cope with the absorbed ozone dose, the leaves get damaged. We recently showed that ozone-tolerant tobacco varieties synthesize a semi-volatile substance in their trichomes (plant hairs) located at the leaf surface and "spray" a diterpenoid compound onto the plant surface. The diterpenoid layer at the plant surface reacts with ozone hence decreasing the amount of ozone entering the leaf through the stomata. So it seems that certain plant species synthesize their own ''protective cream'' against harmful ozone stress. These plants are already well prepared for increasing ozone levels in the future. With enthusiastic support of the students as young scientists, we want to measure the spatial distribution of the ozone concentration in the Alpine valley Oberpinzgau. Together with the University experts the students will build and program "low-cost" sensors for ozone, NOx, temperature, radiation and humidity. They will test bean plants, which should serve as bio indicators to estimate ozone-uptake. These research stations will be set up in the students home villages to generate a unique dataset that will help to better understand the spatial distribution of ozone in an inner alpine valley. In addition, the spatial distribution of the effective ozone dose for plants in the Oberpinzgau region will be determined for the first time. In a labor based approach we will investigate why some plant genotypes react extremely sensitive to ozone while others withstand high ozone concentrations. 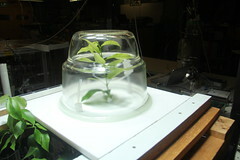 For this purpose, plants are enclosed in a glass cuvette and treated with ozone or other oxidants. With scientific instruments we will detect volatile products of ozone plant-surface reactions,. This innovative approach will focus on plant defense against abiotic stress.